'Ello, ello! As I mentioned in my Urban Decay Naked 2 Basics Review, it's becoming increasingly necessary to do this type of side-by-side comparison post as the "naked" palette eyeshadow phenomenon keeps growing. There are so many subtle variations to each palette! How to we know what will work best on us? How do we know we won't have dupes? Well, my ladydollsandpossiblymen, that's what I'm here for. Bring on the neutral synonyms! Here we have the new Naked 2 Basics Palette on the left and the original Naked Basics on the right, both offered for $29 each. 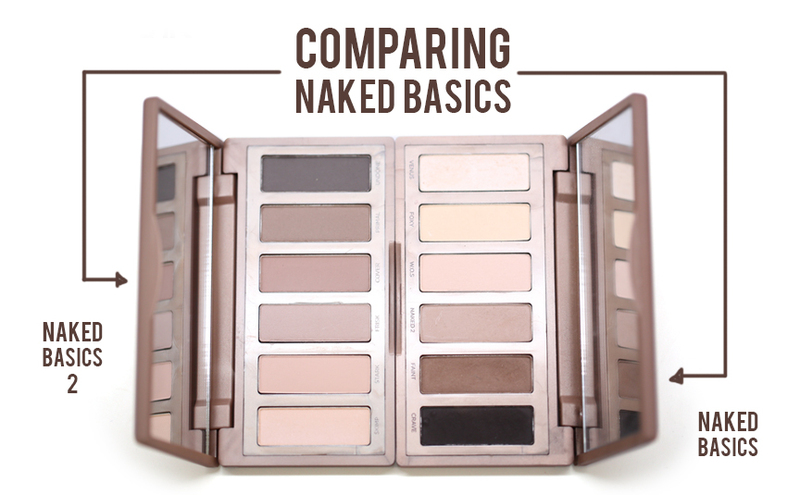 In the same vein as the full-sized Naked 2, Naked 2 Basics is a cooler, taupe-based palette compared to the Naked Basics. Both palettes are the same size and contain 5 matte shades and 1 highlight shade in a satin finish. 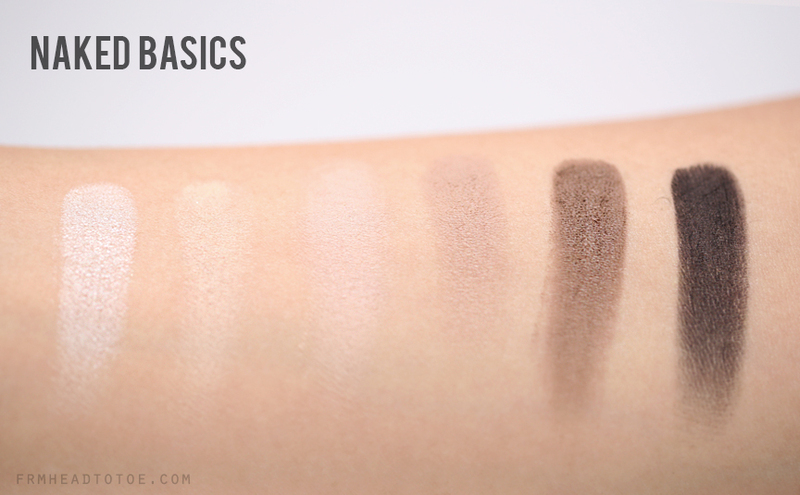 You can see in this side-by-side that Naked 2 Basics also falls within the more medium-toned range compared to Basics which has an almost-white highlight and an almost-black darkest shade. 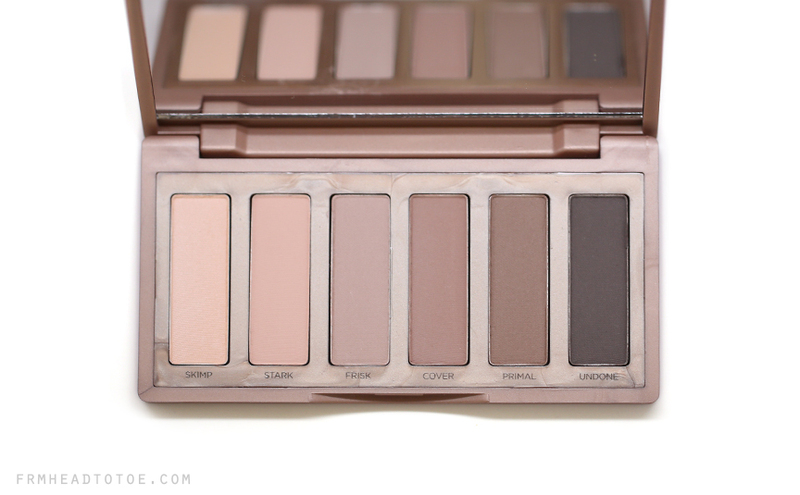 As a small recap, Naked 2 Basics is a taupe-based matte palette with 6 cooler taupe and rosy-brown shades. Because the steps of intensity between each shade are more subtle, this would be a great for someone who loves a consistent neutral look day to day. The original Naked Basics actually runs on the cooler side as well but has more yellow-tones and comes with a much more vibrant satin color, Venus, while the rest of the palette is matte. There is a bit more variation here than Naked 2 because Venus is so light and Crave is so dark. I went ahead and re-shot photos of the Basics palette so that I could match settings and lighting as closely as possible. If you were looking quickly you might think that the second photo was just me turning up the contrast in photoshop but you'd be wrong! Here you can really see the subtleties between each color in Naked 2 Basics. Unfortunately for me, my medium skintone doesn't show off the first half of the palette at all. Naked Basics also has a similar problem since the middle 3 colors seem to fade into my skin. Naked 2 the shadow (and Frisk from Naked 2 Basics which is similar) can be used as a nice blending shade, but Foxy and Walk of Shame don't add much unless I want duplicate, subtle highlight colors. The saving grace of Naked Basics is that Venus, Naked 2, Faint, and Crave (1, 4, 5, and 6) can create a beautiful and complete eyeshadow look. 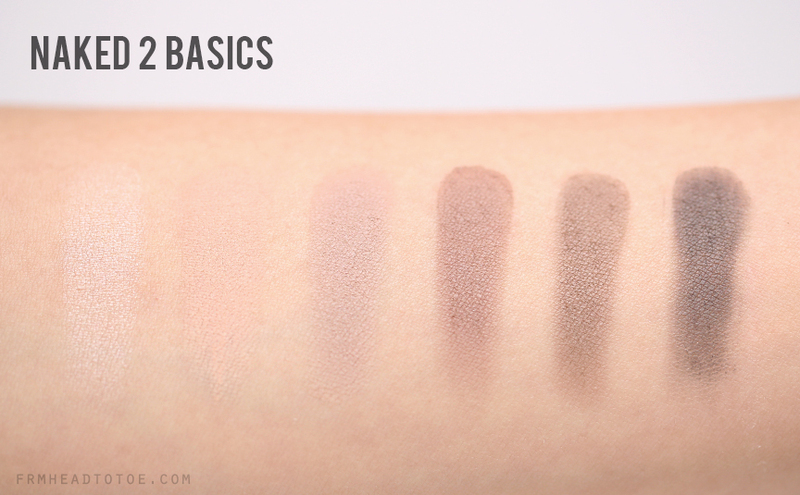 I could use the comparable shades from Naked 2 Basics but it would be a much softer version. Overall, I would recommend Naked 2 Basics for girls with cooler skintones that are paler than my golden medium shade. It could definitely also work for girls who just love taupes and enjoy an easy-to-get-right, natural look everyday. The original Naked Basics will work for a wider variety of skintones although it does have a couple of lighter shades that would work best on skintones lighter or darker than mine. It's still one of my favorite workhorse palettes though and a great travel companion since it can range from subtle to dramatic smoky looks without taking up much space. For more in-depth information, you can check out my full reviews of the Naked Basics Palette and Naked 2 Basics Palette. 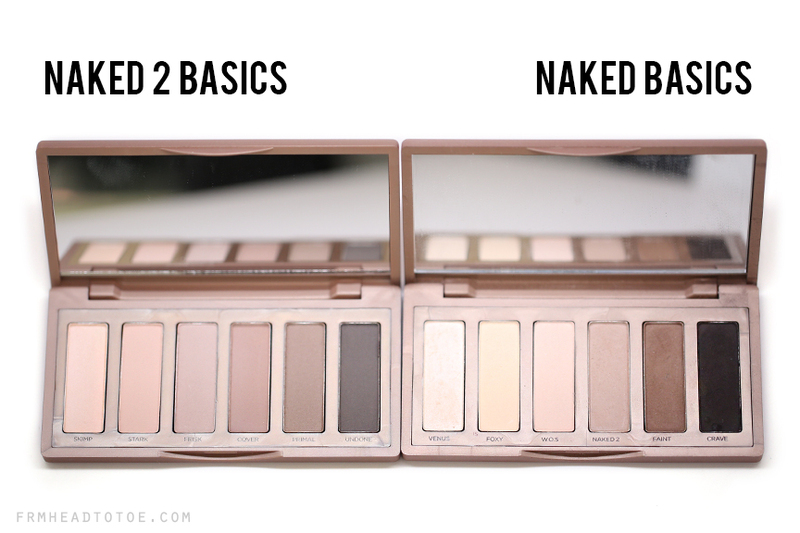 Readers, does your gut pull you more toward Naked 2 Basics or the original Naked Basics palette? Do you go more for a consistent everyday look or do you like variety? Let me know in the comments what you prefer and why! Wow, thanks for the comparison swatches! I have always contemplated getting the Naked Basics (original) palette but felt that some shades would be too light. I kind of wish I could pick and choose different colors for both and create my 'ideal' basics palette, haha. I can't even say I like one better than the other at this point either.. I guess it just means more time playing at the store swatching these myself! haha Thanks again! Great post. I COMPLETELY agree! I wish I could take 3 middle shades from naked 2 and put them in the original instead of the ones that disappear on me. Half and half, haha! Thanks!! Love your blog and videos BTW. I haven't tried the coastal scents ones but I'm actually currently in love with my LORAC Skinny Palette. It's also a smaller neutral palette but it contains warmer tones and it's only $15! I would definitely prefer the Naked 2 basics over the first one.. somehow the later is very ashy on me so I didnt get around buying it! Thanks so much for the comparison Jen! Hmmm I have basically hit pan on the original Basics palette. It's one of my favorite go-to neutral palettes. In fact I used it more than the larger Naked 1 and 2 palettes. It might be nice to have a softer coordinating palette in the same vein if I hadn't already found the Cargo Vintage Luggage palette last year. I used that and the regular Basics interchangeably and it has a few more colors to offer as well. Thanks to your review now I know I don't absolutely NEED the newer edition :) Your photos and editing are really fabulous! Really needed this Jen! Thank you! I have the first Naked basics but do enjoy the stronger ashy tones! I really really like your Blog! You have interesting Stuff on it. Maybe you want to follow each other via GFC? If yes please tell me that you followed me and i follow you back, beauty :). This is a really great post. It's great to see comparison shots. Thank you for the swatches and review! I wasn't particularly excited about the Naked Basics 2 and this just affirmed that! I definitely need to get my hands on the 1st one though! I want to try the 2 since my skin gets really pale in the winter! I like the naked 2 basics because I like the more subtle neutral look. Its my everyday go to palette. Thanks for your excellent reviews and tutorials for a make-up dummy like me! You make applying eye makeup look so easy (however when I try it, it never turns out as nice as what you demonstrate). Could you post a video tutorial on doing the "complete eyeshadow look" with the Naked Basics that you refer to in your review? Thanks again! I'd love to have the second palette, but I love Venus and Crave. And Foxy matches my skin color perfectly so it's awesome for no makeup looks. The second palette doesn't have a dark enough shade to work as an eyeliner.